Photo/ Kim Break Alton School District is launching an app for smartphones and unveiling a website update on Monday, Feb. 29. Pictured from left to right are Ben Scully and Gregory Cooper, Apptegy representatives, Chris Coffel- Alton IT director, Holly Reese- director of special programs, Pam Gilliland- high school counselor and Tonya Willard- elementary school counselor. Inset: The app will be ready for the public to download to their iOS or Android operating smartphones on Leap Day. Alton School District is set to release their smartphone application on Leap Day, Monday, Feb. 29. Alton will be the first school in Oregon County to have an app which can be downloaded to any iOS or Android operating system. Along with the release of the new app, the school will launch their new, improved and updated website. 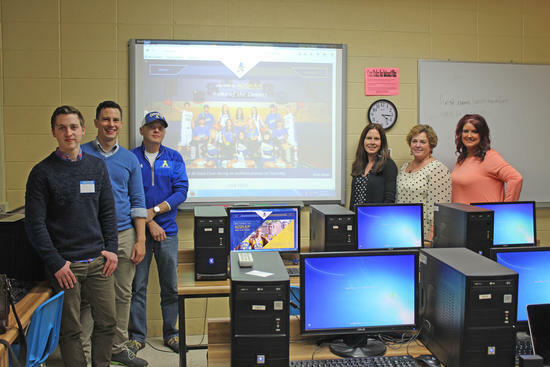 Earlier in the school year while at a conference, Alton teachers and staff were introduced to the company, Apptegy, which is based out of Little Rock, Ark. and focuses on improving the accessibility of school information on the quickly changing forms of technology. The company has been around for several years but has seen a lot of growth in the past year, servicing schools in Arkansas and Oklahoma. Alton is the first school in Missouri to sign on with Apptegy. Alton Internet Technology (IT) Director, Chris Coffel began working with the district in November and was eager to jump on board with the strides in technology the school was taking. "The school had been looking to revamp the website just because it didn't really represent the Alton Comet feel that we wanted it to for the community," Coffel said. Alton staff, faculty, parents and kids take great pride in their district and wanted the website to exhibit that pride. In reference to the app, "The community and student body will have somewhere they can go to for updates. I think it is going to be a hit. We are Apptegy's first school in Missouri," said Coffel. The process of the app design and website revamp started early in the school year. Coffel and teachers have been able to make changes during the whole process to make sure the website includes everything they need it to. In order to enhance the app and website, the Apptegy crew has made both very user-friendly and will have a very similar menu. "It will be pretty seamless. Once it is launched people will see how easy it is," said Coffel. Coffel described the websites change as "night and day" from the existing website. "It will be brighter, have more content, more frequent updates and community interaction," he added. The app will feature a service where someone can submit a question to the school district, send a celebratory message to any student, faculty, team or the school in general by just a tap. Anything that is posted on the app or website, will automatically be distributed through the school's Twitter account. Most live feed will go through each social media provider. "We are really excited about it. Seeing what we have currently to what we are going into, is exciting. Anybody who downloads the app, student or community, they are going to love it and it will be utilized," said Coffel. Ben Scully and Gregory Cooper have been the team from Apptegy who has trained Coffel, teachers and staff on maximizing their options for the website and app. A clean dining menu for lunch and breakfast, event calenders, athletics page and the option to update live scores, Google Maps and more are some of the features Apptegy offers to make the app user-friendly. "We serve 50 schools in Oklahoma, Arkansas and now Missouri, with Alton being our first. We are starting to quickly grow across the country. We are the first company to allow the schools to access social media from one platform. This lets parents in the whole community to see what is happening at the school," said Cooper. The thing that sets Apptegy apart from other companies that design websites and apps is the control program, Thrillshare. "Thrillshare is the communication platform. This is what sets us apart too. Thrillshare is the outlet for people to access what they need. We are always updating Thrillshare and welcome feedback from our schools," said Scully.